In July 2017, Krakow hosted the 41st session of the UNESCO World Heritage Committee. This year, the high-profile event was characterised, on one hand, by a tendency to politicise certain issues seemingly remote from politics, and on the other hand, by an unprecedented acceptance of NGO observers, who were often given the floor. The session was also marked by unexpected decisions concerning a number of World Heritage sites. The Convention Concerning the Protection of the World Cultural and Natural Heritage is an international treaty underlying the work of the United Nations Educational, Scientific and Cultural Organisation (UNESCO). Signed in 1972, the Convention came into force in 1975. It was followed two years later by the establishment of the World Heritage Committee, an executive body with rotating membership and decision-making powers for implementing the Convention, including the inscription of new natural, cultural or historical properties on the World Heritage List. The main objective of the Convention is to promote the recognition and preservation of these unique properties—be they extensive natural areas or small sites, individual cultural or historical monuments or entire cities or locations. Since 1978, UNESCO has used six evaluation criteria to determine a site’s uniqueness and outstanding universal value, adding another four criteria in 2002. For example, to be considered natural heritage, a site must contain areas of exceptional natural beauty and aesthetic importance or represent major stages of the earth’s history, significant on-going ecological and biological processes, or contain significant natural habitats for in-situ conservation of biological diversity. Different criteria are used for the selection of cultural sites, taking into account not only and not so much a site’s aesthetic characteristics as its role in reflecting an important interchange of human values, its historical or technological uniqueness. Today, the World Heritage List includes nearly a thousand sites in 157 State Parties, unevenly distributed around the globe. The largest number of WH sites are located in Italy, China, Spain, France, Germany, Mexico, India, Britain, Russia and the United States—some 350 sites in total which is more than a third of the entire list. It is understandable that many of the World Heritage sites are also symbols of the countries in which they are located, such as the Easter Island (Chile), Angkor Wat in Cambodia, the Great Wall of China, Versailles, Cologne Cathedral, the Acropolis in Athens, the Taj Mahal in India, Petra in Jordan, Chichen-Itza and Teotihuacan in Mexico, the Sydney Opera House in Australia, the Moscow Kremlin and the Historic Centre of St. Petersburg in Russia, and others. What are the advantages for a State Party to the Convention to have new sites added to the World Heritage list? The most important advantage is international attention and promotion, helping to bring tourism to the site. In addition to economic benefits from tourism, the country can also receive assistance from UNESCO’s World Heritage Fund formed by voluntary and required fees by the State Parties and by other contributions, including private donations. The World Heritage Committee can allocate funds in the form of low-interest or interest-free loans repayable on a long-term basis, should a State Party need such assistance. In exceptional cases and for special reasons, non-repayable subsidies may be granted, which is particularly relevant for low-income developing countries. In addition, UNESCO is always prepared to provide advice, experts and equipment a State Party may require. The need for such assistance must be thoroughly justified, and before accessing the funds, States have to go through a series of scientific, economic and technical assessments (largely due to the complexity of this procedure, Russia, for example, has never applied, despite having 25 WH sites, some of them not in the best condition). There is also a list of requirements and recommendations for the States Parties; in particular, they are invited to submit periodic reports to the World Heritage Centre (serving as the focal point for WH-related matters) on the status of the WH properties located in their territories, receive monitoring or advisory mission, etc. The Convention’s current 172 States Parties are very diverse in terms of their administrative structure, political and legal systems, and the level of democracy. One would find it hard to compare, for example, Germany and Uzbekistan, but the fundamental purpose of any international convention is to promote the convergence of laws and enforcement practices and more broadly, states’ policies in areas covered by these treaties. This sounds good in theory, but in reality universal compliance with treaty standards can be undermined by differences in the economic situation, domestic legislation and civil society development in the States Parties. Indeed, civil society is an essential factor in World Heritage preservation, and its role cannot be overestimated. In most cases, non-profit organisations and informal citizen groups are more committed than governments to preserving unique natural and historical sites. World Heritage Watch is a German NGO that has launched the challenging initiative of bringing together non-profits dealing with World Heritage issues in their countries. For the third consecutive year it has been conducting civil society forums parallel to the Annual Sessions of the UNESCO World Heritage Committee. Thanks to these, the author of this article was able to observe first-hand the difference in approaches and opportunities across civil societies. This year, Poland has attracted international attention not only for hosting the annual WH Committee Session but also for the country’s attempt to establish a sad precedent in the history of the WH Convention. On behalf of the Polish government, its Minister of Environment Jan Szyszko voiced the country’s intention to have the Bialowieza National Park, which is part of the Bialowieza Forest (Belovezhskaya Pushcha), delisted from World Heritage sites to enable commercial forestry on the property. Virtually everything about this proposal is extremely unusual. First, this would be the first case of a State Party seeking to have a site delisted. Second, the Bialowieza National Park, Poland, was inscribed on the World Heritage List in 1979 and extended to include Belovezhskaya Pushcha, Belarus, in 1992, with a large extension of the single Polish/Belarusian site in 2014.It is therefore technically impossible to delist the ‘Polish’ part of the WH site, as it would necessitate a revision of the entire nomination (similarly to what it would take to delist a portion the Moscow Kremlin as a World Heritage Site.). These proposals were supported by the bark beetle scare which, according to the Polish authorities, had massively affected the Białowieża Forest. Explaining their decision by “environmental safety purposes,” the authorities permitted sanitary felling, first in the section of the forest which was not part of the World Heritage site and then in the site’s buffer zone. The initial plan was to fell 63,500 cubic metres of timber over 10 years. But the authorities reached the target within four years, followed by a decision to increase the felling target five-fold. Local environmentalists made a big noise, and the authorities had to temper their appetites for a while. Another problem is that the Polish and Belarusian parts of the Bialowieza/Belovezhskaya Pushcha vary greatly in terms of approaches to forest management and environmental protection. On the Belarusian side, the entire territory is a large national park in which preservation has been declared a priority. In contrast, on the Polish side, just about 17 per cent of the forest, or some 10,500 hectares enjoy protected status, while the State Forest Service manages the rest of the unique forest, and individual forestry districts play a key role. The Polish authorities have described the bark beetle outbreak as an epidemic, a message likely to be perceived by the lay public as a sufficient reason for drastic action. Fortunately, Poland also has a well-developed civil society and independent mass media capable of voicing alternative perspectives. Last year, organisations such as Greenpeace Poland, Fundacja Dzika Polska, WWF Poland, ClientEarth, and a few others, strongly critical of Poland’s forest management plans, prepared an independent report providing scientific proof why extensive sanitary felling could destroy rather than save the forest by stripping it of natural adaptability and causing further spread of the bark beetle. Pushing on multiple fronts, Polish environmentalists engaged with the World Heritage Centre and the International Union for Conservation of Nature, UNESCO’s technical consultant on natural heritage properties, and also complained to the European Commission against Poland’s infringement of EU nature protection law. While the former would affect Poland’s image due to the loss of the only World Natural Heritage site within its borders, the latter could trigger tangible financial and administrative sanctions from the European Union. “Comprehensive research and analysis conducted by the Polish NGO coalition has revealed that sanitary logging is simply a ploy to access the forest’s timber reserves. At least 78 per cent the wood extraction in Bialowieza as part of the sanitary logging was commercial and reached the market. It means that the bark beetle outbreak was a pretext used to increase logging and someone’s profits,” said Robert Cyglicki of Greenpeace Poland addressing the World Heritage Watch NGO Forum. The Bialowieza defenders’ dedicated lobbying and expertise resulted in an IUCN Advisory mission to the site in 2016. The IUCN Regional Director Luc Bas who participated in the advisory mission agreed that the unique forest could lose its ability to recover naturally if massive logging continued. During the recent World Heritage Committee session at which Poland was expected to present its proposal to remove the forest from the World Natural Heritage List, local environmentalists staged a colourful protest rally outside the ICE Congress Centre, the session venue. The environmentalists were not alone: separated by a police cordon, opposing rallies by members of the Polish Solidarity and Forest Workers’ Unions were held nearby. The latter hardly made any statements of their own, but the moment the environmentalists started speaking from the stage, their opponents immediately sounded an alarm and started blowing whistles. The forest defenders had brought creative handmade posters and costumes, while their opponents were supplied with identical industrially produced banners delivered to the place. The police, however, did not interfere with either rally, both lasting for more than three hours, while the WHC plenary meeting continued behind the walls, keeping everyone guessing as to what the final decision would be. This year the Committee was more than ever welcoming towards NGO representatives. It not only gave them access to the venue and to members of the official delegations, but also allowed two-minute contributions. In particular, Polish NGO observers were able to say their ‘final word’ just before the vote on the Bialowieza Forest. This may have played a decisive role: the Committee decided to postpone its decision on Bialowieza for a year and requested more information from the Polish Government concerning the reasons behind its intention to remove the National Park from the World Heritage List. The environmentalists welcomed the Committee’s resolution as their victory; as it was announced, most of the audience gave it a standing ovation. Amidst smiles and hugs, this emotional moment demonstrated the power of civil society. In the context of this impressive campaign of Polish environmentalists, it might be interesting to examine a similar situation in Russia. Over the past nine years, the World Heritage Committee has repeatedly drawn the Russian Government’s attention to various concerns and threats involving the Western Caucasus site which includes the Caucasus (Kavkazskiy) State Biosphere Reserve and a number of other protected areas in Krasnodar Province, Adyghea and Karachaevo-Cherkessia. Some of the issues included the construction of a ski lift at Lunnaya Polyana and on the slopes of Fisht Mountain (the Committee did not mention the resort in its decision, as officially Russia had declared the construction to be that of a ‘scientific centre’), the dangers of recreational development and construction of ski resort infrastructure on the Lagonaki plateau and within the Fisht-Oshtenskiy Massif (plateau), the absence of a buffer zone around the Western Caucasus site, and large-scale logging in the protected Nature Reserve area. In 2015, new concerns emerged on top of the old ones: Rosa Khutor is a company associated with Russian oligarch Vladimir Potanin that owns and operates a ski resort of the same name in the Krasnaya Polyana area (Sochi). The company approached the Russian Government with a request for a 49-year lease of certain sections of the Sochi National Park “for the development of sports and tourism.” The properties were then leased out to a number of offshore companies registered in Cyprus and owned, according to some sources, by Potanin’s Interros Holding Company. A number of those leased out properties with a total area of ​​just over 390 hectares are located on the territory of the former Sochi Zakaznik (upper reaches of the Mzymta River) adjacent to the Caucasus Reserve. Before the 2014 Sochi Olympics, the Russian authorities had promised to include the former Sochi Zakaznik in the Caucasus Reserve as compensation for the environmental damage caused by the development in preparation for the 2014 Games. However, the authorities failed to live up to this promise and did exactly the opposite: in November 2015, the Russian Minister of Natural Resources Sergei Donskoy signed amendments to the Regulations on the Sochi Zakaznik permitting commercial development of the formerly protected area. Then in March 2017, Russian Prime Minister Dmitry Medvedev ordered the leasing of a few properties located near the Western Caucasus WHS to companies operating the Rosa Khutor ski resort. In 2014, Russia applied to change the boundaries of the Western Caucasus site removing most of the Lagonaki and Fisht-Oshten plateau from the protected area and instead including parts of the Sochi National Park and Zakaznik adjacent to the Caucasus Reserve. A year later, before the merits of the application could be considered, the Russian authorities suddenly withdrew it; at about the same time, Rosa Khutor began the construction of a road to the upper reaches of Mzymta. At the moment, the Western Caucasus WHS remains within its 1999 borders, and still faces the same unresolved issues and threats. A coalition of environmental organisations, including Greenpeace Russia, Environmental Watch on North Caucasus and NABU-Caucasus, have repeatedly urged the World Heritage Committee to move the Western Caucasus site to the World Heritage in Danger List, with potentially unpleasant consequences for the Russian authorities, such as closer scrutiny of the Western Caucasus property by UNESCO, heavier reporting requirements and damage to reputation likely to affect the promotion of the would-be ski resort, thus bringing financial loss. The chances of the Western Caucasus site being added to the World Heritage in Danger List first increased in 2008 when a number of Olympic facilities were planned to be constructed next to the Caucasus Reserve. At that time, the Russian authorities were still willing to engage with environmental NGOs, and President Putin agreed to move the facilities away from the UNESCO WH site. In the years that followed, the legislation governing non-profits became increasingly repressive, culminating in the ‘foreign agents’ and ‘undesirable organisations’ laws, in addition to unprecedented pressure on the few remaining independent media outlets, draconian restrictions on street protests and virtually unlimited powers granted to security agencies to oversee civic activists and associations. In particular, the authorities deployed a smear campaign in government-controlled media against Greenpeace Russia, WWF Russia and particularly the Environmental Watch on North Caucasus (EWNC). Greenpeace also came under particular pressure from security agencies after the Arctic Sunrise incident, and the EWNC was listed as a ‘foreign agent’ last year and faced huge fines. In this context, Russian environmental NGOs are forced to explore other methods and approaches to protecting World Heritage sites and monitoring Russia’s compliance with its international obligations. As opposed to Poland and other EU countries, in Russia we are forced to de-emphasise public campaigning, focusing instead on advocacy with UNESCO, IUCN and the United Nations Environment Programme. In particular, just before the 41st WHC session, a coalition of Russian environmental NGOs released a joint statement which summarised, while trying to avoid political references capable of triggering yet another round of repression, Russia’s compliance—or, rather, non-compliance—with the Committee’s previous decisions on the Western Caucasus property. The environmental NGOs urged the WHC to take into account Russia’s systematic failure to meet its obligations as well as the Committee’s earlier decisions on the Western Caucasus and asked for a monitoring mission to be sent to the site to examine its current status and assess imminent threats. What was the outcome? In its Decision 41 COM 7B.8 concerning the Western Caucasus property, the Committee noted with concern the recent legislative changes, which left serious loopholes enabling commercial development of protected areas, including WH properties. This refers to amendments to the Law on Protected Natural Territories passed by the State Duma in late June 2016 making it possible, following its entry into force on 3 July 2016, to set up so-called ‘biosphere polygons’ within natural reserves. Formerly, ‘biosphere polygons’ were located outside reserves and were used for environmentally friendly operations, such as limited grazing, hiking tourism, etc., in combination with efforts to protect landscapes and ecosystems. The Committee also once again warned the Russian authorities against skiing facilities construction on the Lagonaki Plateau, including Mount Fisht and Oshten, and requested detailed information “on the current status of any existing plans for large-scale tourism and sport infrastructure within the property.” Russia must submit this information to the World Heritage Centre by 1 February 2018. Thus, Russia has once again received a ‘final warning,’ which this time might really be final, leading to the inscription of the Western Caucasus property on the shameful List of World Heritage in Danger in 2018. 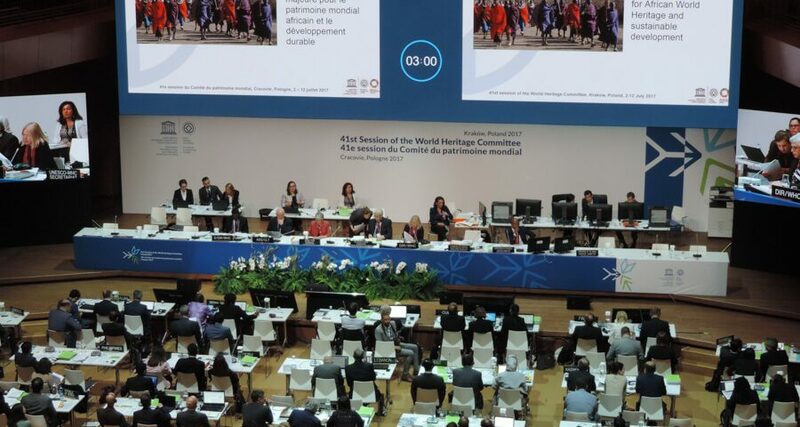 The favourable decisions made by the 41st World Heritage Committee session on the Polish and Russian WH sites should not make environmentalists in both countries complacent. On the contrary, we should see them as yet another reason to step up our efforts and engage with the media, participate in public debates and share expertise by preparing articles and reports. By comparing the cases of the Bialowieza and the Western Caucasus, we can clearly see the effect of democratic standards and procedures on environmental protection: in one case, the government makes an error but is prepared to listen to others and tolerate different opinion in mass media and public protests, while in the other case, the government is openly protective of private business interests and instead of listening to criticism, makes every effort to suppress the critics.